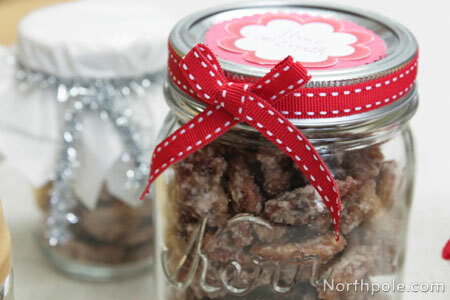 Gifts in a jar are a Christmas classic. 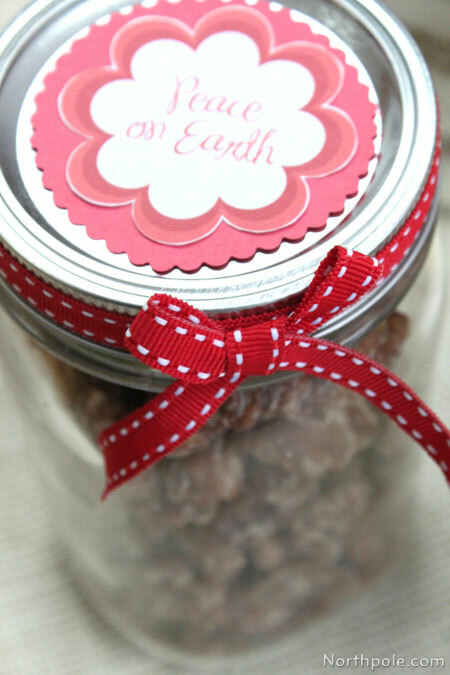 They are a great way to share your tasty baked goods or other homemade goodies during the holidays. 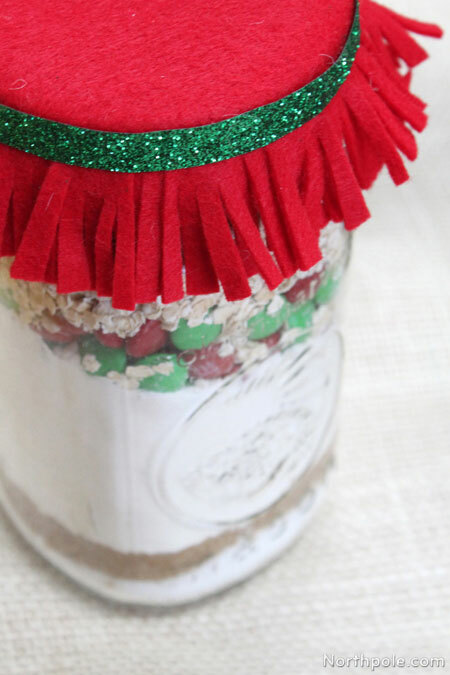 And since no one wants to give a plain ol’ jar, here are some ideas to snazz them up. 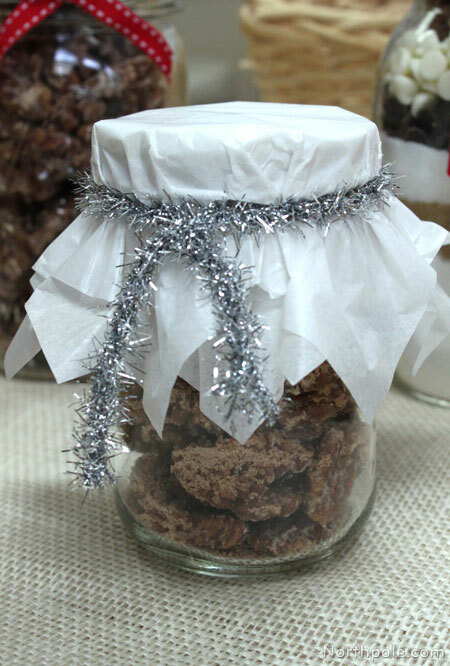 It doesn’t take much to decorate a jar, so you could just dig through your box of recycled wrapping supplies and use what you already have. Tie a ribbon around the band of the jar. Use any kind of ribbon you’d like. 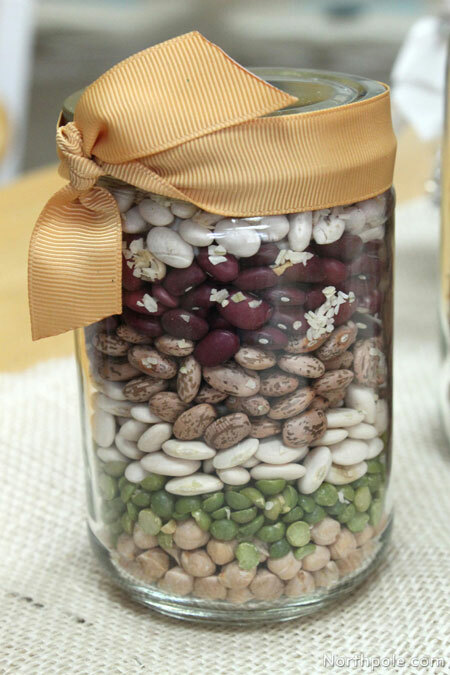 Here we used a grosgrain ribbon on a jar of Winter Bean Soup Mix. The nice thing about grosgrain is the texture! It’s a little stiffer than other fabric ribbon, which allowed us to fold down one of the tails that was sticking up. We think it’s pretty either way, so it all depends on your preference. 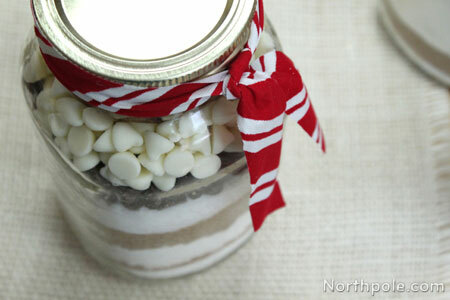 Below we tied a knot of red and white striped polyester ribbon around the band of a jar. 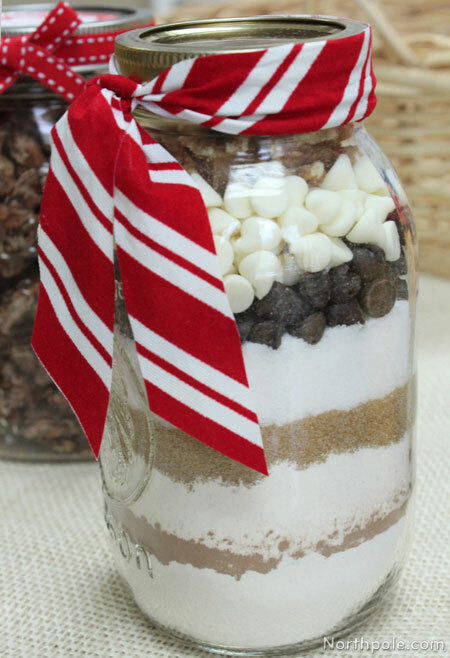 Inside the jar is a delicious brownie recipe from Mrs. Claus’ Cookbook called Sand Art Brownies. Aren’t the layers of ingredients so pretty? First, glue one piece of ribbon to the band of the jar using hot glue. Then tie a bow with the other piece of ribbon and glue the bow on the band. 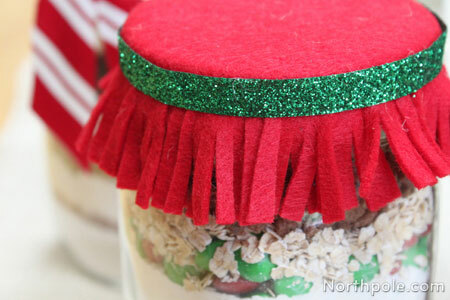 Decorate the lid with paper. Get creative with scalloped-edge scissors and scrapbook paper! 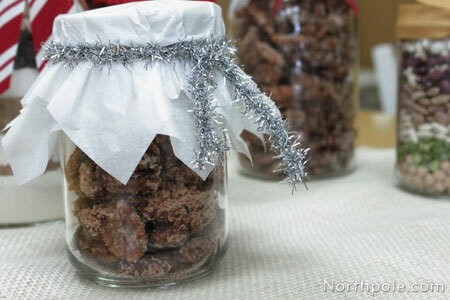 Here, place a few squares of tissue paper on the jar, and then wrap it with a piece of wired ribbon. The “ribbon” actually looks like mini-garland—we found it at the craft store amongst the holiday ribbons. Is it just us or does the jar look like a shepherd? You could even take it a step further and make a “nativity set” of jars. Use different colored tissue paper and paint faces on the jars, which would make a nice craft for Sunday school. 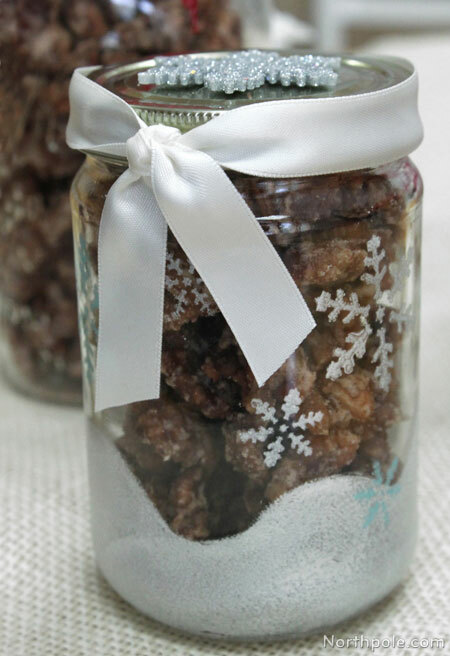 The jar here is filled with some tasty Sugared Nuts. 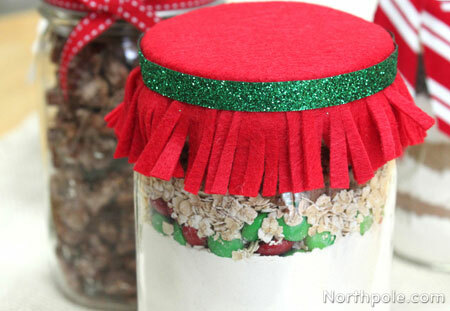 This next jar decoration is made from a felt circle that is about 3" wider in diameter than the jar’s lid. Cut fringes that are about 1" long around the circle, then use a rubber band to hold the felt to the jar. Then use hot glue to attach a piece of ribbon. And lastly, you can paint designs on the glass. We used stencils with pearl white, pearl blue, and glitter blue paints to create this design! To see how to paint this winter wonderland, click here. 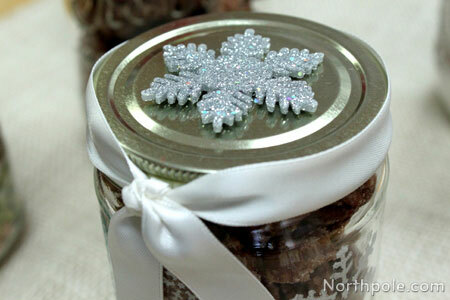 To finish up this wintery jar, tie a satin ribbon around the band and glue a mini snowflake ornament on top. 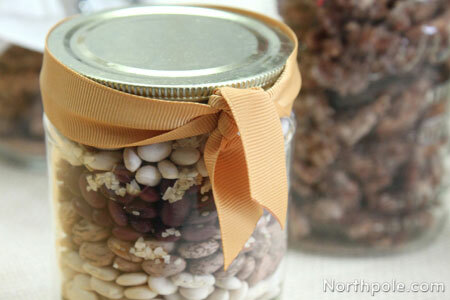 You can repurpose any kitchen jars, such as those from spaghetti sauce, nut butters, jams, etc. Usually the labels come right off by soaking the jars in hot soapy water. But for the stubborn labels that don’t come off with soap and water, use Goo Gone. Have fun decorating and sharing!